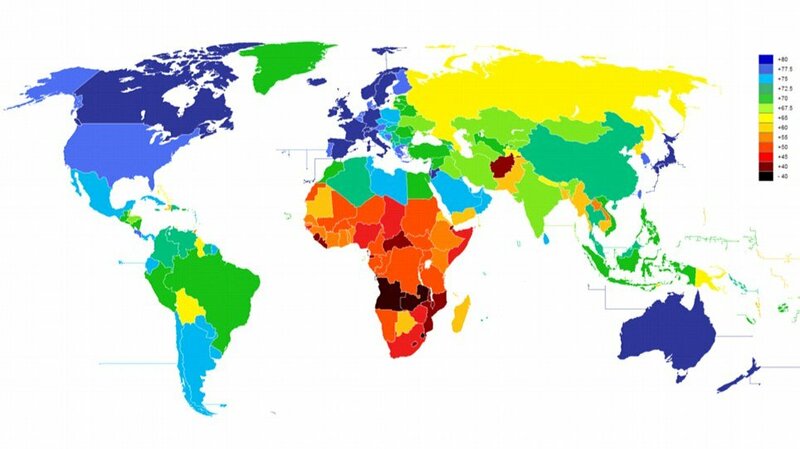 CIA World Factbook color-coded map reveals the startling difference in life expectancies across 222 of the world’s countries. The map shows how people are likely to live the longest in developed countries with state-funded healthcare systems like Japan, Canada and the UK, which each have average life expectancies of over 80 years. The tiny tax haven of Monaco – with its notoriously wealthy inhabitants and compulsory state-funded health service – has the highest life expectancy at an average of 89.68 years, five years higher than anywhere else on earth, according to the CIA World Factbook. The country with the worst life expectancy is the African state of Chad at a shocking 48.69 years. Life expectancy in America ranks 51st in the CIA’s table at 78.49 years – lower than Canada (81.48), Australia (81.90), New Zealand (80.71), Japan (83.91), the UK (80.17) and much of Europe. Of the top five longest-living nations the only large country is Japan, with the rest being city states (see box). Life expectancy levels in South America and generally 10 years lower than those in North America. People are likely to live the shortest in sub-Saharan Africa, with no country in that vast region having an average life expectancy of over 60. Only a few Asian countries, including Afghanistan (49.72) and a couple of Caribbean nations, have such similarly short life expectancies compared with Africa. The worst countries to live in if you want to reach old age are Afghanistan (49.72), Swaziland (49.42), South Africa (49.41) Guinea-Bissau (49.11) and Chad (48.69), whose people are generally expected to die before they even reach middle age. The figures confirm that women on average live longer than men. Life expectancy for a woman in Monaco is 93.77 years compared with that of a man at 85.74 years. In Chad life expectancy for men is only 47.61 years while women are expected to live slightly longer to 49.82 years. While The United States has consistently fallen in the rank of world nations over the last 50 years, the average life expectancy has risen from 69.8 years in 1960 to 78.49 today. And while Chad’s figure of 48.69 today is shockingly low, in 1960 Afghanistan had the world’s lowest life expectancy at 31.3 years.